Since 2009 we have had the pleasure of getting to know fellow enthusiasts, either by our interactions on various social media outlets or just plain hanging out. We have seen many come and go with their Mazda platforms, but we always continued to enjoy seeing what they are up to with their next projects, even if it isn’t a Mazda. However, the greatest thing we absolutely love is our long time friends that continue on with their Mazda platforms; improving on them year after year. Such a person is Kevin Ehm’s 2005 Black Mica Mazda 3 sedan from New York, which is a veteran here on the MF blog. We first met Kevin back in 2010-2011 in the post The Sedan from New York and then Sedan at it Again! Here we are nearly 3 years later with the current status of Kevin’s sedan. And it is safe to say that 2013 has brought about a lot of changes for the car and for Kevin, himself. What has changed the car and made the biggest impact on it? Well there is no doubt that the fender flares have made the biggest impact. They are about 60mm fender flares that allowed Kevin to fit his aggressive Zauber Crazers. However, it would not been possible to fit the wheels also without Kevin’s modified front lower control arms and rear camber arms. The camber adjustment really helped bring it all together. Running -6 degrees in the front and -11 in the rear. Kevin’s Zauber Crazers were custom built by our friend Easton over at CZ Wheels, who built these to 19×11 +7 in the front and 19×12 -32 in the rear with powdercoated candy red faces and polished lips. Sitting on pieced together coilover suspension allowed this to sit how Kevin wanted it to. BC Racing coilovers in the front with custom springs and Yellow Speed struts with custom springs. Both front and rear fenders have been radiused to 4 inches and 4.5 inches, respectively before the fender flares were put over them. What does it mean to have radiused fenders? You are raising the wheel arch on the fender so it is higher up and having a larger diameter to accommodate larger more aggressive wheels. Usually this will also mean that you can set your suspension to have full travel and still ride as low as possible. However, one down side to this is you will have an increase in fender gap even if you are lower than the car next to you; your wheel to fender distance is more. Therefore, you need to measure for the right amount of radius. 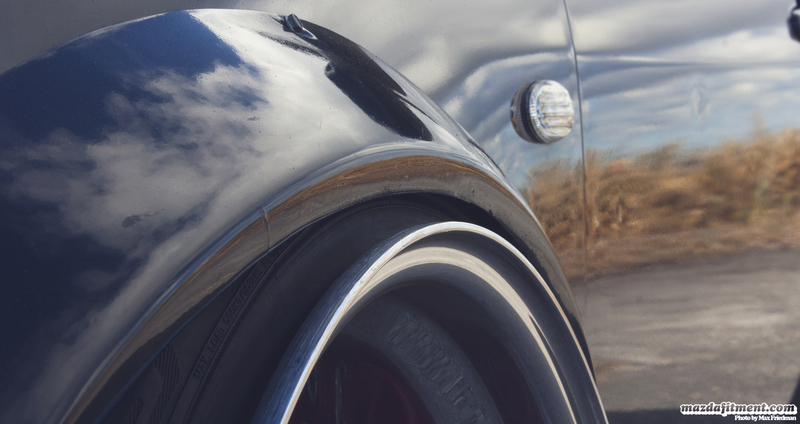 In Kevin’s case, you could set the fender flares to create your own wheel to fender distance. At the end of the day the two things people look at are the ride height and the wheel to fender fitment. Kevin has the probably one of the lowest static ride heights and best fender to wheel fitment for a regular Mazda 3. Something anyone should appreciate, because it is no easy task and you can see some uniqueness behind it. Thanks to Max Friedman for sharing these photos with us. This wasn’t a planned photo shoot, so not bad for a spur of the moment thing. If you want to check out more, there are a few more images in the gallery below and more on Max’s Flickr. Enjoy.